A 28-year-old man, Munado Tomworio, has allegedly killed his girlfriend identified as Victoria Ekalamene at Oluasiri in Nembe Local Government Area of Bayelsa State. The suspect allegedly shot her dead after accusing her of infidelity. He was said to have queried the deceased at gunpoint about an unknown man and suddenly the gun went off, shattering her face. It was gathered that the incident, which occurred at about 11pm on Sunday, caused panic. Following the sound of the gun, residents were said to have rushed to the scene, overpowered and apprehended him. Sources said he was handed over to the police for investigation and prosecution. An eyewitness wondered why a man would kill a girl he had not paid her dowry, on suspicion of cheating. Police spokesman Asinim Butswat confirmed the incident, saying the suspect was being detained at the command’s headquarters in Yenagoa. 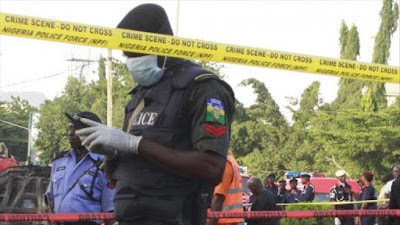 Butswat, a Superintendent of Police, said: “On April 14, at about 2245 hrs, Mr. Munabo Tonworio, male, 28, shot dead his lover, Victoria Ekalamene, female, after a quarrel, at the home of the deceased at Oluasiri in Nembe Local Government Area of Bayelsa State.